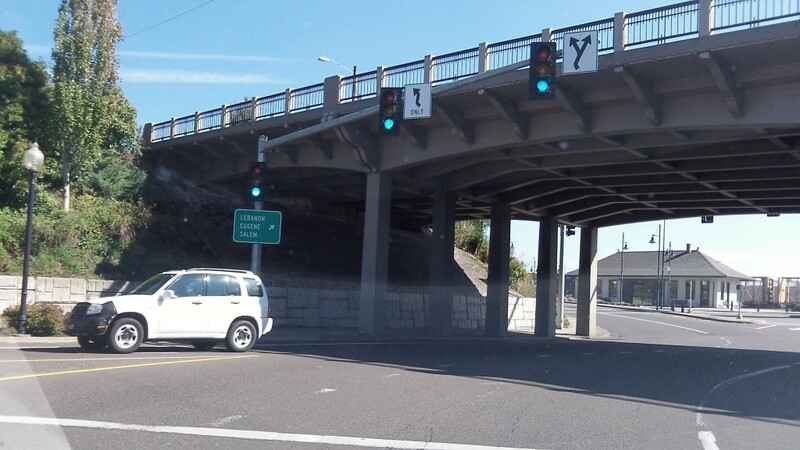 It’s been a few years now since a driver from out of town swore he got a raw deal when he got a ticket for going through a red light at the Albany underpass, at Ninth and Lyon. Now, based on observations such as the one above, I’m wondering if he was right. If memory serves, the officer in that case was waiting at the signal on Ninth and the light had just changed when the driver came through the underpass ahead of him. The reasoning was that if Ninth had a green light, the signal for Lyon under the underpass must have been red, and the officer pulled the guy over. The driver fought the ticket in municipal court and lost. Then he sued the city in circuit court on his own, without a lawyer, and lost again. The driver’s contention was that he had a green light. Nobody believed him. It turns out, though, that when you’re waiting at that light, it’s not uncommon for the last in a line of vehicles to come through the underpass in front of you while your signal has already been green for a few split seconds — just like in the photo here, shot on the afternoon of Oct. 4. You see this especially when there is steady traffic from the direction of Pacific and Albany Station. Mary Grace, on Facebook: Happens all the time…. “Animus Vox,” on Facebook: The city was wrong, and the driver was right. Those lights are often simultaneously green. The problem needs to be corrected, and in a perfect world, the driver that sued would get a public apology from the city along with a refund.